Paschasius Radbertus (died c.860) was for about seven years abbot of the French abbey of Corbie, but he resigned this post because of a dispute, and this allowed him to devote more time to study and writing. His works included a biography and several commentaries on biblical texts, including the Old Testament book of Lamentations. This copy was owned by, and probably written at, the Benedictine abbey at Reading. 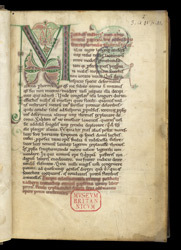 The first page of text contains a prologue, introduced by a fine large foliate initial 'M'. In the extreme right margin the guide-letter 'M' is still visible.